The pericarp of evergreen small arbor Citrus reticulata Blanco of family Rutaceae. Collected in autumn when the fruit is ripe. Strongly fragrant, pungent and slightly bitter. Big, integrity, deep-red scarfskin, white interior, plenty of flesh heavy oily, dense fragrance and pungent. Pungent, bitter, warm; spleen and lung meridians entered. Promote flow of qi, arrest vomiting, dry dampness and resolve phlegm. It is good at moving spleen-stomach qi and the action is mild. It is indicated for syndrome of qi stagnation in spleen and stomach. It also can check adverse rise of qi to arrest vomiting, dry dampness and invigorate spleen, so it is suitable for nausea and vomiting due to qi stagnation in spleen and stomach, especially dampness accumulation and qi stagnation. For gastric and abdominal distension, stuffiness, fullness and pain due to qi stagnation in spleen and stomach, it can be used alone or combined with the qi-regulating and middle-energizer-harmonizing herbs. For instance it is combined with Mu Xiang in Kuan Zhong Wan from the book Ji Feng Pu Ji Fang (Universal-Relief Prescriptions from Jifeng). For gastric-and abdominal distension, nausea, vomiting and diarrhea due to damp accumulation and qi stagnation in middle energizer, it is usually combined with the damp-resolving and qi-moving herbs. For instance it is combined with Cang Zhu and Hou Po in Ping Wei San from Tai Ping Hui Min He Ji Ju Fang. For gastric and abdominal distending pain and poor appetite due to food stagnation, it is usually combined with the digestant herbs. For instance it is combined with Shan Zha and Shen Qu in Bao He Wan from Dan Xi Xin Fa. For the syndrome of spleen deficiency and qi stagnation manifested as gastric and abdominal distension, abdominal pain preference for palpation, poor appetite or distension after meal, loose stool, it is usually combined with the qi-tonifying and spleen-invigorating herbs. For instance it is combined with Dang Shen, Bai Zhu and Fu Ling in Yi Gong San from Xiao Er Yao Zheng Zhi Jue. It can not only move qi but also check adverse rise of qi and harmonize stomach to arrest vomiting, so it can be combined with other herbs for vomiting and hiccup. For nausea and vomiting caused by qi stagnation in middle energizer and failure of stomach qi to descend, it is usually combined with the stomach-harmonizing and vomiting-arresting herbs. For instance it is combined with Sheng Jiang in Ju Pi Tang from Jin Kui Yao Lue. For nausea and vomiting caused by damp-phlegm accumulation, qi stagnation and failure of stomach qi to descend, it is usually combined with Ban Xia for drying dampness and resolving phlegm, checking adverse rise of qi and arrest vomiting. For vomiting and diarrhea caused by invasion of exogenous wind and cold as well as invasion of the interior by dampness, it is usually combined with the wind-cold-dispersing, stomach-harmonizing and vomiting-arresting herbs. For instance it is combined with Huo Xiang and Zi Su in Huo Xiang Zheng Qi San from Tai Ping Hui Min He Ji Ju Fang. 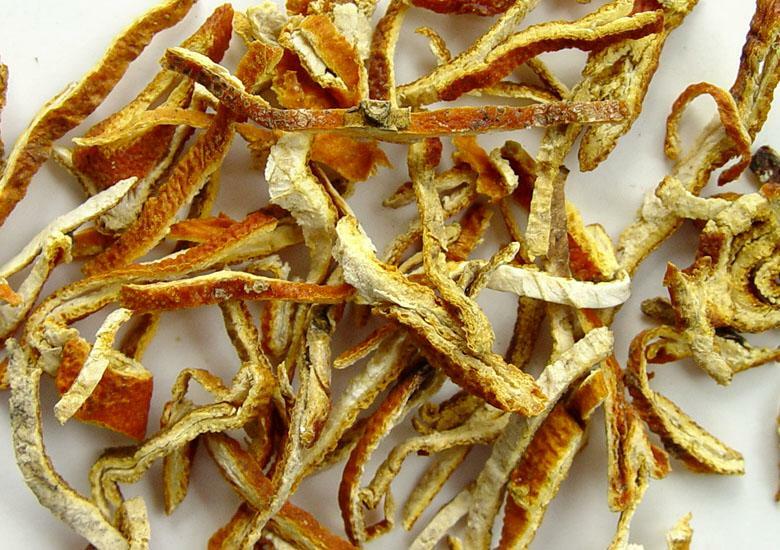 For vomiting due to stomach cold, it is usually combined with Sheng Jiang. For instance they are used together in Jiang Ju Tang from Huo You Xin Shu (Experience of Treating Paediatric Diseases). It can dry dampness and resolve phlegm, disperse and descend lung qi, so it is indicated for cough caused by damp-phlegm or cold-phlegm. For cough with profuse sputum, chest fullness, nausea and vomiting due to damp-phlegm accumulation, it is usually combined with the damp-drying and phlegm-resolving herbs. For instance it is combined with Ban Xia in Er Chen Tang from Tai Ping Hui Min He Ji Ju Fang. For cough due to cold-phlegm manifested as profuse and clear sputum, chest fullness, profuse saliva, it should be combined with the lung-warming and phlegm-resolving herbs. For instance it is combined with Gan Jiang and Gan Cao in Si Shun San from Sheng Ji Zong Lu. In addition, it can be used in the tonifying and replenishing formula to strengthen the transportation and transformation of spleen.